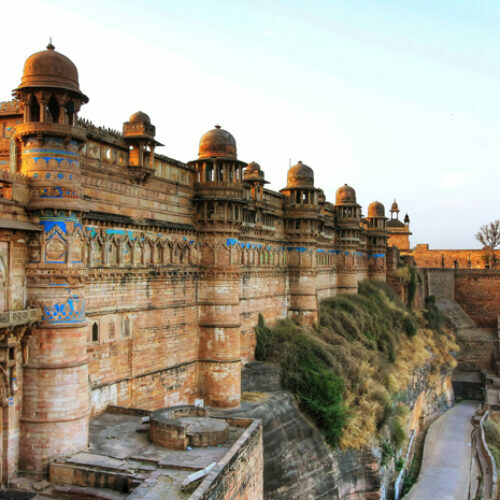 Situated in the northern reaches of Madhya Pradesh, on the edge of Rajasthan, Gwalior is well worth a visit away from the more popular, neighboring cities of Agra and Jaipur. 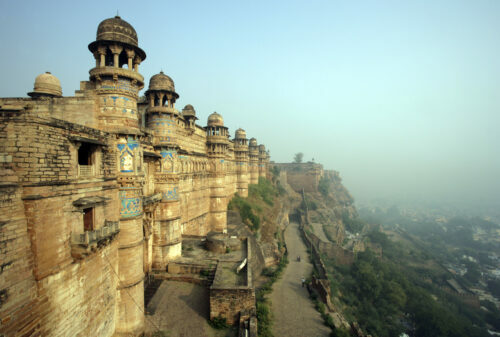 Dominated by one of India’s most imposing hilltop forts, the Gwalior Fort was built in the 8th century and is a mighty citadel that has been well maintained throughout the years. You will find the iconic towers of the Man Singh Palace still ringed with colourful turquoise tiles. The fort occupies over a 3km outcrop of sandstone to the north of the city and houses several temples, water tanks, palaces and a public school. Reaching the fort, you can drive up the western track and observe the mighty rock-cut Jain statues, dating back to the seventh and fifteenth centuries, that line the way. Considered the second largest city in Madhya Pradesh, the bustling city throngs with life, beneath the imposing hill top fort. Here you will also find the European style Jai Vilas Palace, crammed with curiosities and wonderful kitsch memorabilia. The grandiose palace was built in 1875 by Maharaja Jayaji Rao Scindia, in an attempt to rival the colonial raj of the time, with many an ode to Buckingham Palace, Versailles and several Greek ruins and Italian manor houses. Here the most famed possession is possibly the miniature working, silver toy train that was used to dispense brandy and cigars along the dinner table. 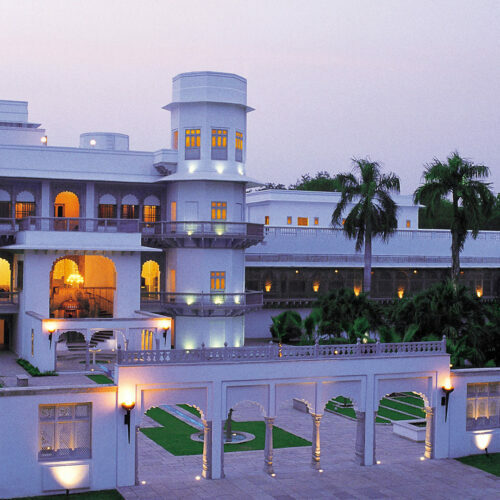 Stay at the regal Taj Usha Kiran Palace the once royal residency, which sits adjacent to the opulent Jai Vilas Palace. Nearby to Gwalior there are several places of interest such as Orchha ‘hidden place’ a delightful little medieval town brimming with markets, temples, palaces, havelis and sandstone cenotaphs floating above the banks of the River Betwa. The mustard coloured ramparts and cupolas of the majestic palace at Datia provide a wonderful labyrinthine palace to explore. 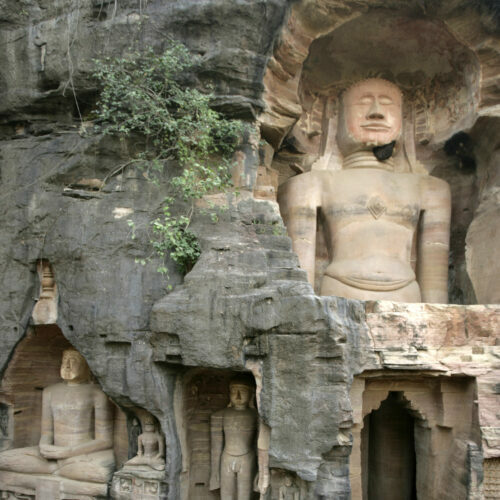 Gwalior also twins well with Khajuraho, home to some of India’s finest temples and a UNESCO World Heritage site. Outside, the bustling city is also home to the extraordinary Jai Vilas Palace the seat of the Scindias one of the country’s most powerful families. Each room is a treasure chest of wonders, from cut-glass furniture, a ladies-only swimming pool with its own boat and a menagerie of stuffed animals. The never ending dining room even houses a model railway with a silver train that carried after-dinner treats. One can join the ranks of dignitary by staying in the beautiful white-and-yellow Taj Usha Kiran palace next door, built in 1880 and beautifully restored by the Taj Hotels.